This protocol describes the crude extraction of DNA from human cheek cells. 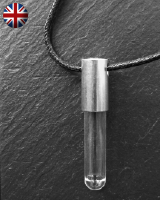 The DNA may be placed in a pendant to be worn round the neck. This activity is intended as a motivational exercise of limited educational value, although it could be adapted (e.g., by adding extra stages such as heat or enzyme treatment) to enhance its educational worth. Basic structure of cells. Knowledge of DNA. Components for making the pendants (alternatively, any suitable small tubes can be used). Used with the general public in the UK. Suitable for use with students from age 10. The NCBE supplies schools with kits of materials to make 30 DNA necklaces.